With the rate chat application are been released these days, I think we are really spoilt for choice. Some people will even consider picking their smart devices over their spouse because it’s not only number one antidote to boredom but it keeps you connected to real people at any given time who shares the same vision with you. 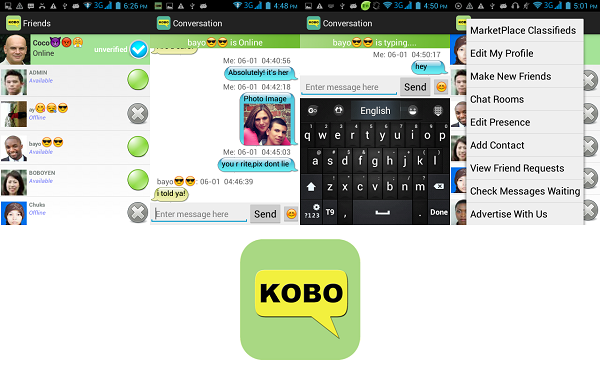 KoboIMis an instant messaging, social networking, and marketplace-classifieds app, with over 1000 Chat rooms, available for download in 16 countries. WithKoboIMusers get the chance to make new friends from around the globe, network, advertise your goods and services, buy and sell used items, and much, much more in a most secure environment. Why Should I Use KoboIM? ==>Meeting thousands of kobo users in over 253 countries. ==>It has online games to every game lover and E-commerce section just to wow you. At the moment, it is available for Blackberry,Android& Nokia phones. look no other place than Kobo Messenger.